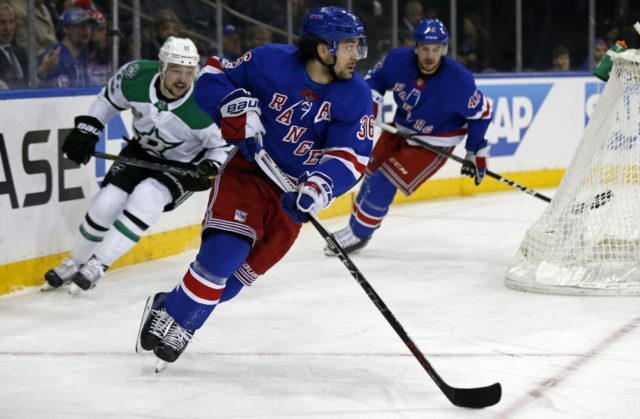 The New York Rangers have traded forward Mats Zuccarello to the Dallas Stars for a conditional 2019 2nd round pick and a conditional 2020 3rd round pick. Bob McKenzie: The 2nd round pick becomes a 1st round pick if the Stars win two rounds. The 3rd round pick becomes a 1st if the Stars re-sign Zuccarello. The 31-year old Zuccarello was undrafted and signed by the Rangers. Bob McKenzie: The New York Rangers are retaining 30 percent of Zuccarello’s salary. Cap Friendly: “Based on the #Stars salary cap situation, NY retaining 30% of Zuccarello’s salary wasn’t enough to make the trade work.